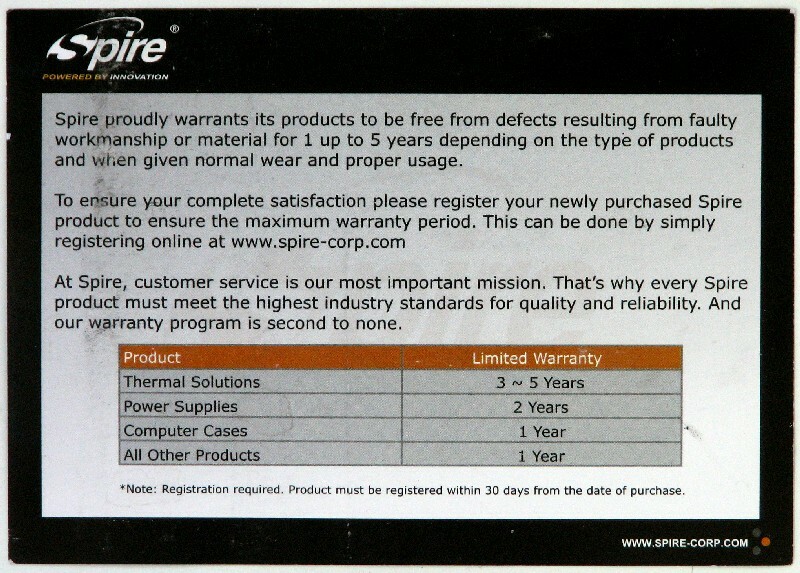 After reviewing the TherMax Eclipse II heatsink in July, I had an exchange of correspondence with Spire; they offered me a chance to review another one of their premium heatsink offerings that looks like it addresses the main weaknesses I found with the reviewed heatsink. 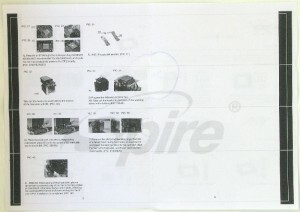 As a result of this correspondence, they sent me the Spire Gemini Rev. 2 to put through the wringer. 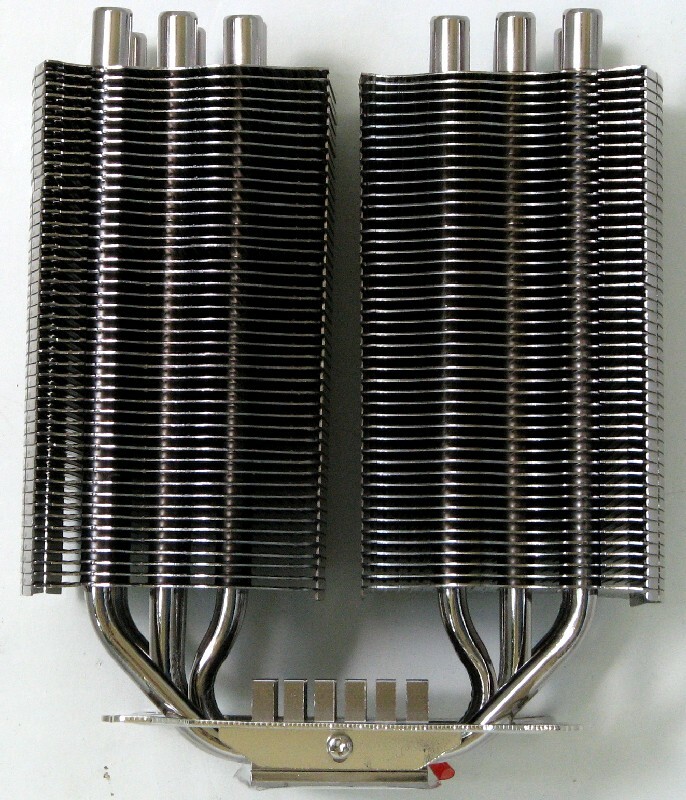 With this heatsink, we get a solid copper base instead of a HDT type base and this heatsink also sports six 6 mm heatpipes instead of five 8 mm heatpipes. 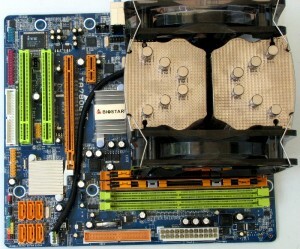 Will this one excel in cooling or will it be another middle of the road heatsink? 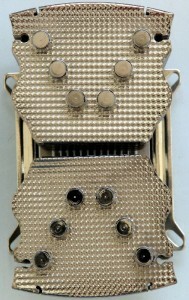 The Gemini Rev. 2 CPU Cooler is compatible with the latest ATX boards based on Intel 775/1155/1156 and 1366 sockets and AMD AM2/AM3/940/939/754 (not G34 compatible). Much like the previous Spire heatsink I tested, the TherMax Eclipse II, the specifications that they give for this heatsink look very good. 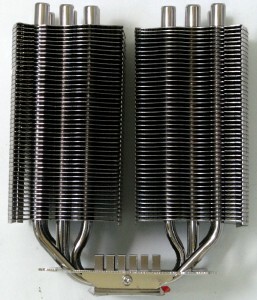 Besides the obvious differences with the base style and different heatpipes, this heatsink also uses different fans than the TherMax Eclipse II. 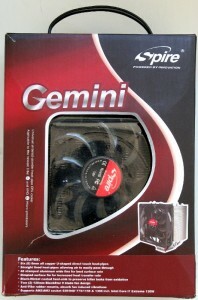 It used single speed fans rated at 22oo RPM and 4.2 watts power draw, but the Gemini comes with two PWM fans rated to run between 600 to 1700 RPM and they draw much less power at only 1.8 watts. 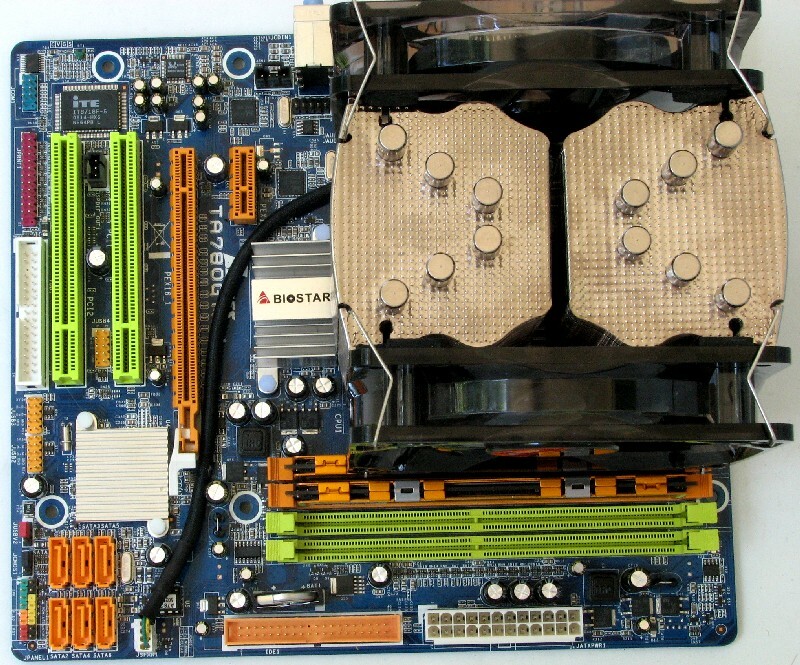 Another component that both heatsinks do share is the bracket attached to the base used to fasten and tension the heatsink to the motherboard. There were no visible differences between the two brackets. Like its brother, the Gemini is also a true out-of-the-box cooling solution, with nothing else required for mounting to your system except from possibly your favorite thermal interface material (TIM) (if you don’t want to use the included TIM). The bare heatsink has a measured mass of 843.8 grams and the included fans measure in at 122.5 grams each, as checked with my Ohaus Model 2610 scale. 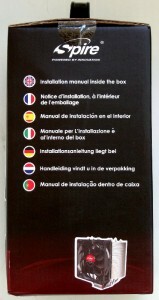 The box this heatsink ships in is much like the one the TherMax Eclipse II is packaged in. The dimensions of it are 9 1/2 X 7 1/16 X 5 1/8 inches (242 X 175 X 130 mm). Inside the box, the heatsink and one fan are packed in a plastic clamshell, which wasn’t damaged this time, unlike the TherMax Eclipse II. 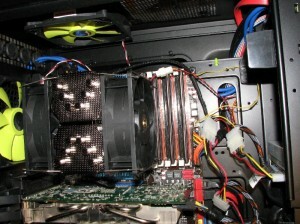 Underneath the clamshell, there is a cardboard box that holds the mounting equipment and the second fan securely. 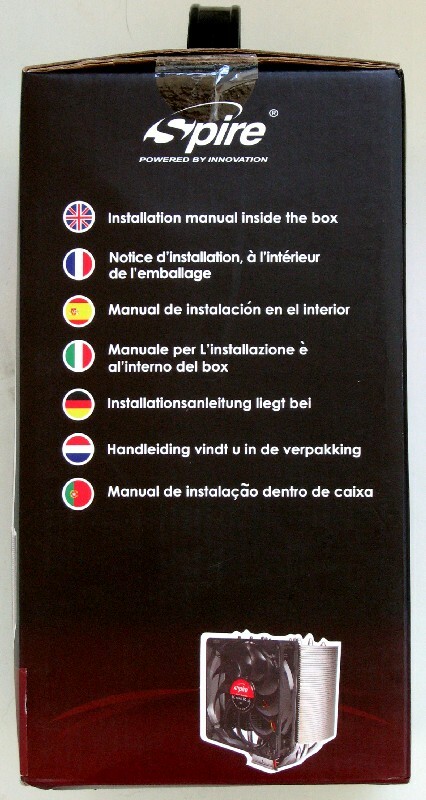 Also, the mounting instructions and a generic warranty paper were included and the box itself has a plastic handle built into the top, just like the other heatsink. All in all, a rather attractive packaging solution that should present well on the shelf. 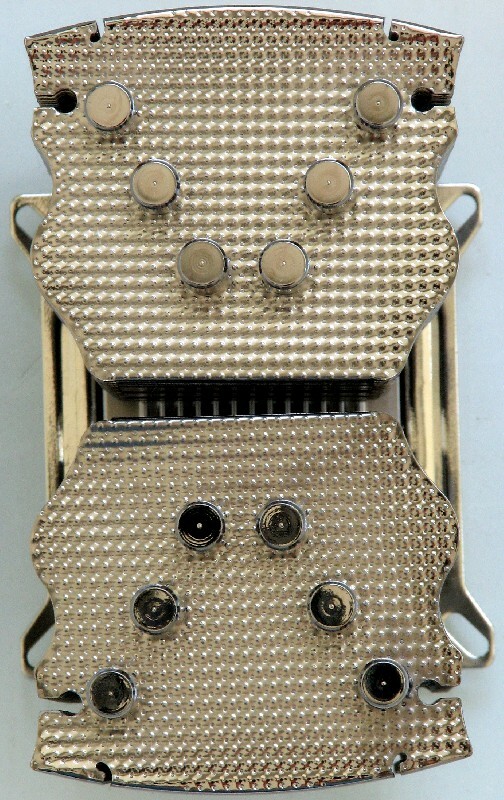 Once we remove the Gemini from the packaging we see a bit of a different design, which is similar to the Prolimatech Megahalems, with separated fins attached to the heatpipes on each side. 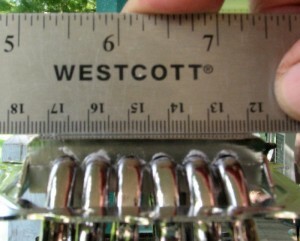 The six heatpipes are arranged in a “V” configuration going up through the fins and the heatpipe ends are finished off with some nice looking caps. The fins themselves have the same basic dimpled design as the last Spire heatsink I looked at. 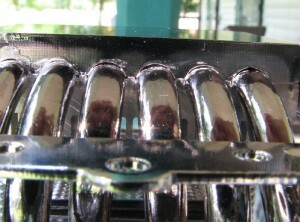 The heatsink itself is completed with a “Black Nickel” finish. 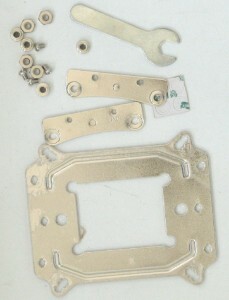 The base, measuring 35 x 53 mm, is flat on both axes and fairly well finished before being nickel plated. One thing that did jump out at me is that Spire is still using a fairly wide spacing arrangement between the heatpipes, which makes the base wider than it should be for best heat transfer, in my opinion. 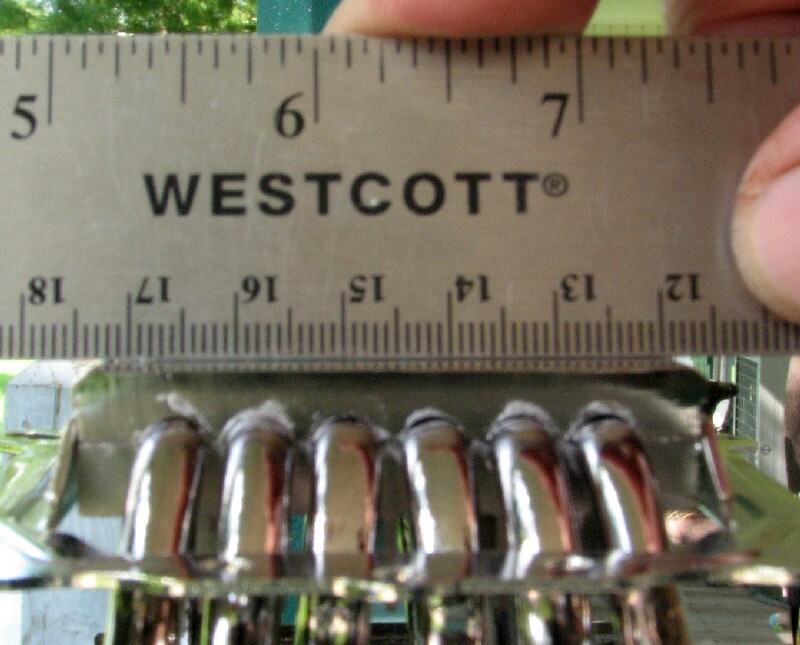 Just eyeballing a ruler while trying to measure the spread of the heatpipes suggests a 2 mm spacing between each heatpipe; from the outside of the two outside heatpipes is about 43 mm across. Compared to this, the TRUE Rev. 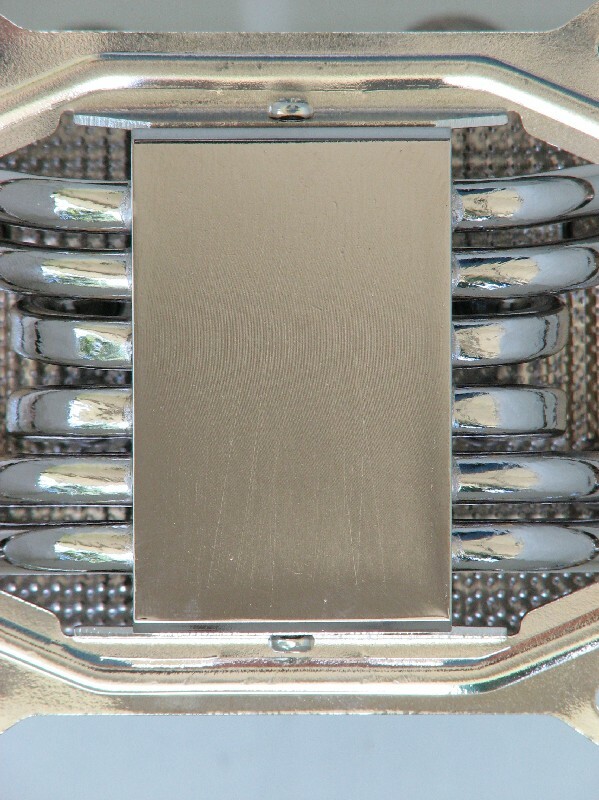 C has 1 mm spaces between the heatpipes and an outside to outside measurement between the two outermost heatpipes comes in at 39 mm. 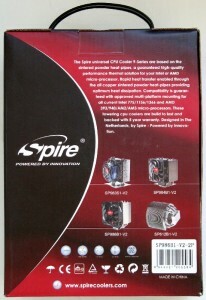 Spire gives full specs for the fans included with this heatsink, just like with the previous one. These fans also use a ball bearing and a sleeve bearing instead of straight sleeve bearings. That should help the fans last a bit longer. 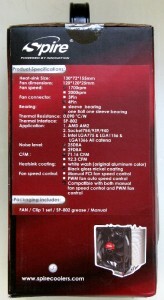 The fans themselves look much like the ones included with the TherMax Eclipse II, but are PWM fans. 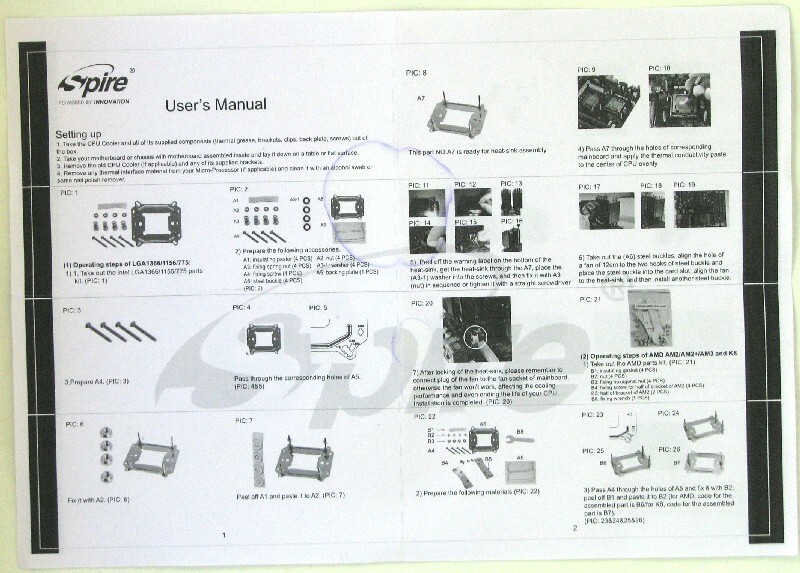 The instruction booklet included with the heatsink is laid out very well, with good instructions and pictures to help with installations and the English translation was done well; the English translation seems to be good across Spire product manuals. 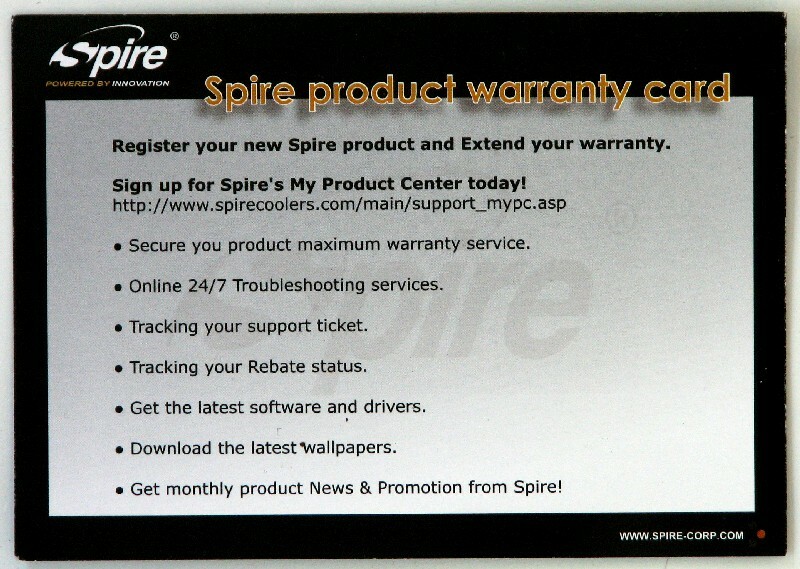 Also included with this heatsink is their warranty card, which is pretty much a general description of the warranties they give with their various products and a link to register your products. With this heatsink also comes a nice PCI bracket fan controller that can control the fan speed of both fans via voltage control. 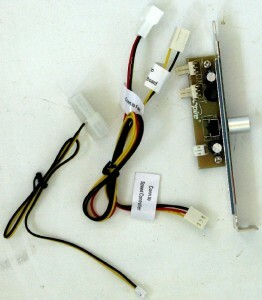 One fan plugs directly into this fan controller while the other is connected to the fan controller through a pass-thru wiring harness that has a connector to hook to the CPU fan header on the motherboard so that you can monitor fan speed. 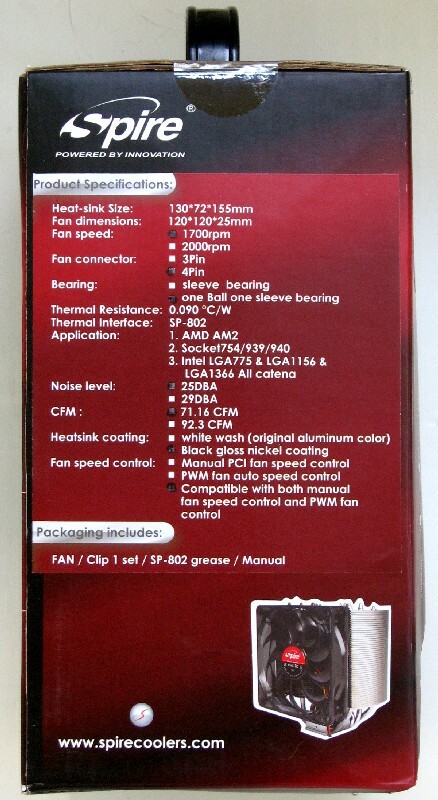 It only allows monitoring the fan speed of one fan, but since they are both connected to the same fan controller the fans speeds should be very similar. A very nice addition to this heatsink, in my opinion, for people who want to be able to control fan speeds as needed and don’t have a couple of PWM fan headers on their motherboard. As for the mounting hardware, I found it to be a bit crude in comparison to Spire’s Tier 1 competition such as Thermalright, Noctua, Zalman and Prolimatech. 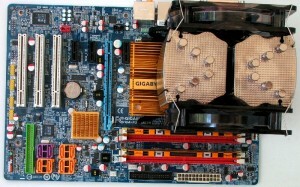 I don’t see any improvement in the mounting hardware between this heatsink and the TherMax Eclipse II in this regard. A nice addition with this heatsink was the fact that Spire added some washers to go between the spring mounted screws and the attachment bracket, which I had to buy for the TherMax Eclipse II at the hardware store. 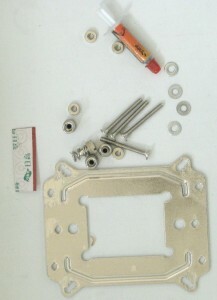 The washer stops the springs from binding up on the bracket, which was a problem I found on the other heatsink. For mounting on AMD systems, they used hex nuts instead of reusing the Intel tension screws and have included a somewhat cheap stamped wrench to fit these nuts. 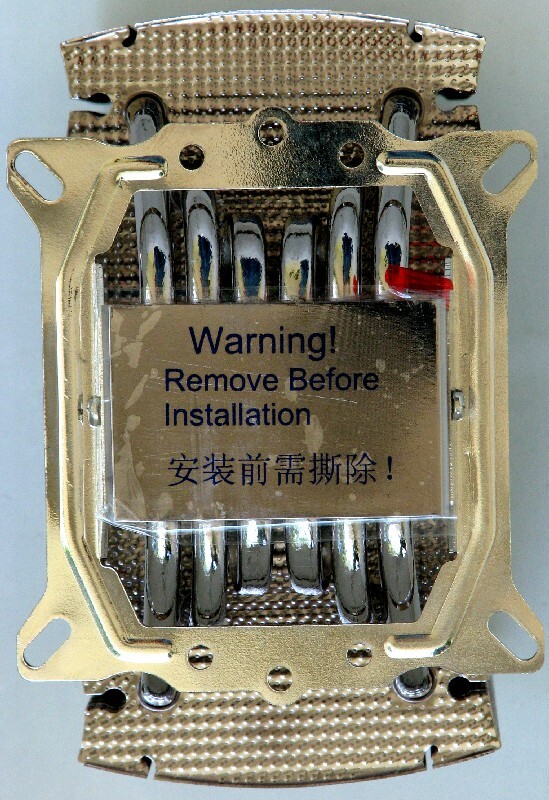 They also don’t use the tension springs as used by the Intel mounting nuts and you pretty much need to tension the heatsink by feel and by eye. I find this to be a bit of a step backward, because it makes getting a good mount on AMD directly related to your eye and touch instead of having a spring loaded nut that bottoms out and uses the springs to give proper tension. With the spring loaded nuts that Spire uses for Intel systems, I found one of them to bottom out at least two revolutions sooner than the other ones. 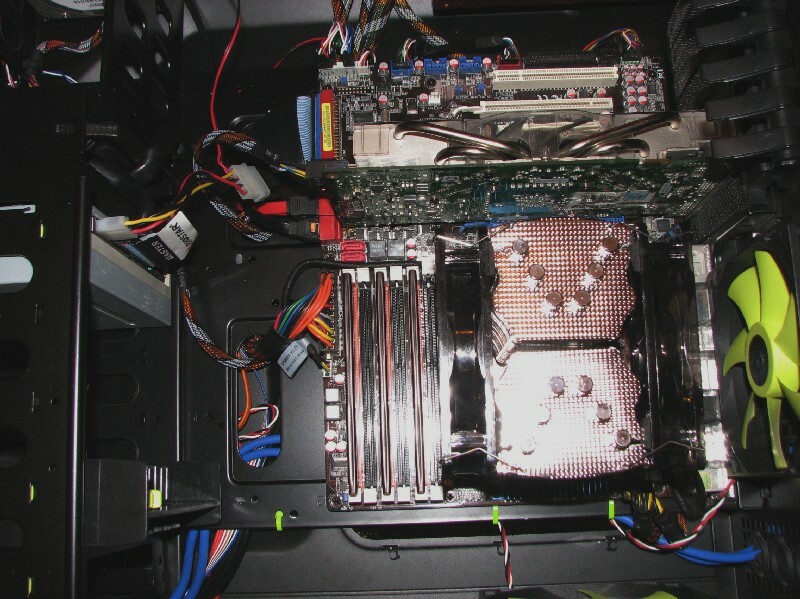 I don’t think it affected the mount to any great extent since they use springs to even the load on the Intel mount, but it’s still a sign of the crudeness of the mounting system. On the fan attachment side, Spire stepped away from using those rubber mounts and went with a spring wire fan mounting system. I found the spring wires to be pretty hard to engage to the heatsink, compared to other heatsinks that use a spring wire fan mounting system. As with the other mounting hardware, I found them to be a bit on the crude side, but held effectively. The two fans included with this heatsink have rubber pads mounted on the corners, which keep the fans from sliding around on the heatsink. 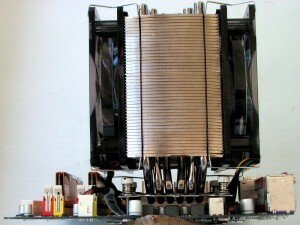 Also, the fan spring wires hold to the outside of the fans, which precludes using the same wire mounts for 38 mm thick fans. 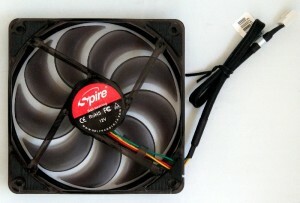 I was able to modify some Prolimatech 38 mm wire clips to fit this heatsink so that I could test with 38 mm fans. 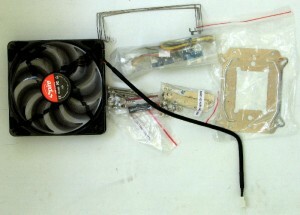 I couldn’t safely mount my 76 mm thick Sanyo Denki compound fan to the heatsink, so I didn’t test with it. Arctic Cooling MX-2 thermal paste was used for testing as I have found it to give good consistent results with no appreciable break in and it applies and cleans up easily. The first thing that I noticed when running the various fan tests on this heatsink is that I saw a noticeable increase in performance with the Gentle Typhoon AP-15 fans compared to the stock fans; with the TherMax Eclipse II the opposite happened. 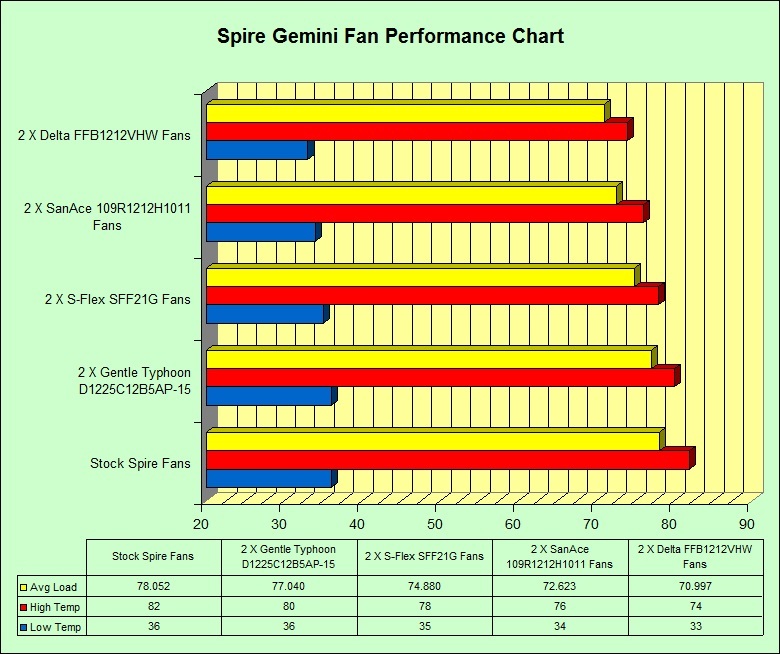 That tells me that the stock fans that come with this heatsink perform worse than compared to the other Spire offering, and offer lower performance than the GT AP-15 fans, which have rated specs lower than the Spire fans. With this heatsink barely edging the TherMax Eclipse II in performance while fitted with the included stock fans, it suggests that the new heatpipe and base arrangement is more efficient than the HDT offering, which is also something I expected. 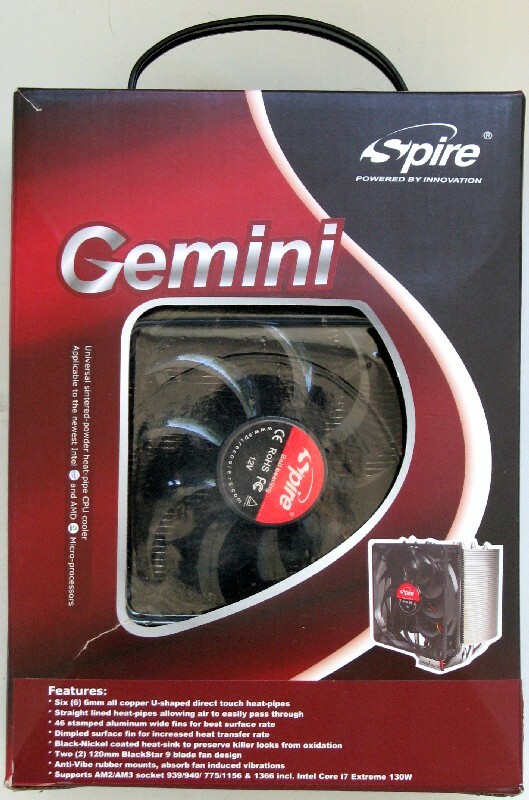 Since they were shipping this heatsink with PWM fans and a fan controller to boot, I would have thought stronger fans, such as the ones that came with the other Spire heatsink, would have been more appropriate. Maybe their included fan controller can’t handle the extra wattage of those fans or Spire doesn’t make a PWM fan in that performance range. Looking at how this heatsink performed with higher CFM, higher static pressure fans, it is pretty clear that the wide, dimpled fin design of this heatsink’s fins prefers fans with higher CFM and static pressure compared to the fans it ships with. 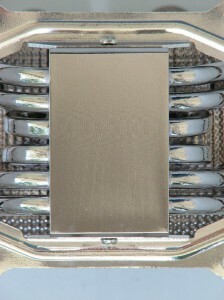 As you can see above, the Gemini Rev. 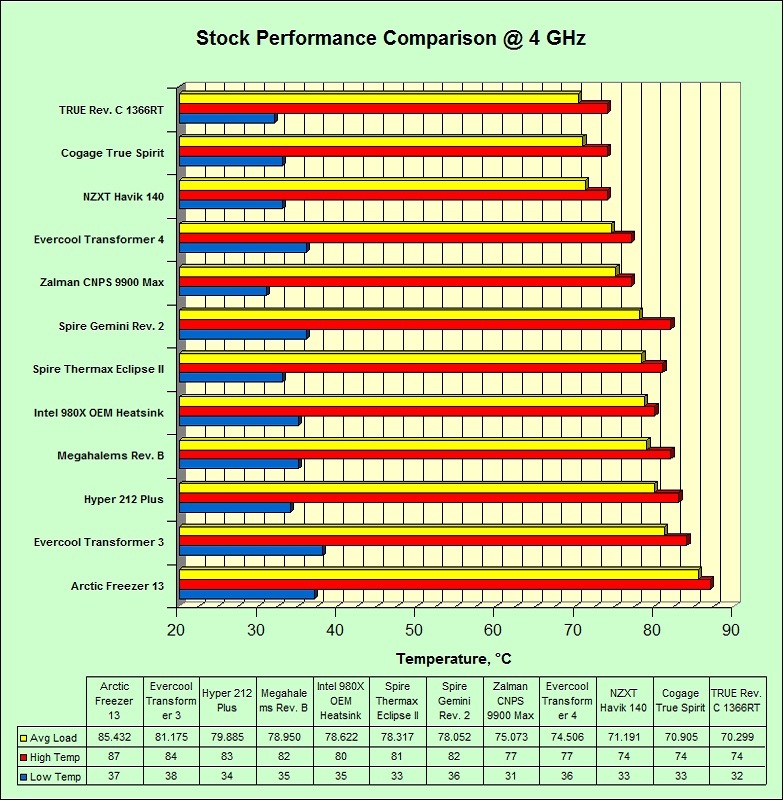 2 just barely edged out the TherMax Eclipse II in cooling performance. While that isn’t a bad result by any means, I think that Spire’s wide spacing between the heatpipes in the base and the relative crudeness of their mounting system is limiting performance. Also, contributing to these results is the fact that the fans included with the Gemini Rev. 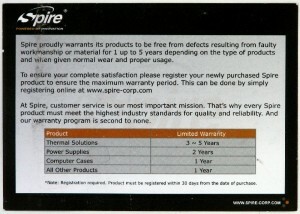 2 are weaker offerings than the TherMax Eclipse II. 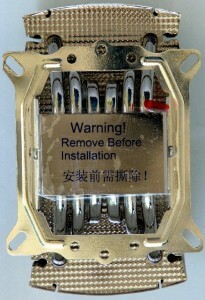 If they could tighten the spacing between the heatpipes and come up with a better mounting system more like their high end tier 1 competition, they would do a bit better on performance and including higher performance PWM fans would also help. 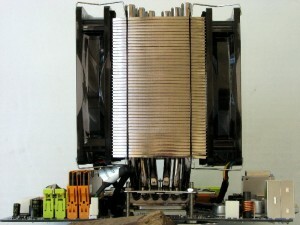 Like its brother, this heatsink also comes up right in the middle of the tested heatsinks in performance. 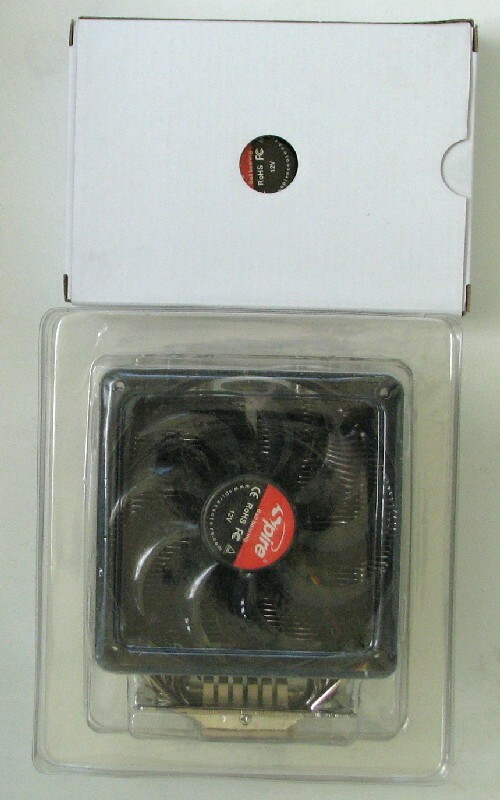 Looking around with a quick search, the cheapest (and only place) I found this heatsink listed for sale is $62.95 at The Heatsink Factory and shipping to my house would cost an additional $7.68, putting the cost for this heatsink to my door at $70.63. That puts it at a significant price premium as compared to the TherMax Eclipse II, but still below some of the other high-end air coolers. In my opinion, this puts it in the upper middle of the price/performance realm. You can do better for your money, but you can also do a bit worse. It also comes with a fan controller, which the TherMax Eclipse II doesn’t have, so that would also contribute to the higher price tag. On the plus side, Spire addressed the problem I had with mounting the heatsink on Intel systems by including some washers to install between the spring screws and heatsink tension plate. But I think they took a step backwards with their AMD mounting system by going with four nuts without springs to tension with and depending upon the user’s experience in tightening the heatsink down correctly by feel and eye instead. Plus, I don’t see a way to safely mount the heatsink on an AMD system without removing the motherboard from the case, because you just don’t have enough room to tighten the nuts down inside the case. 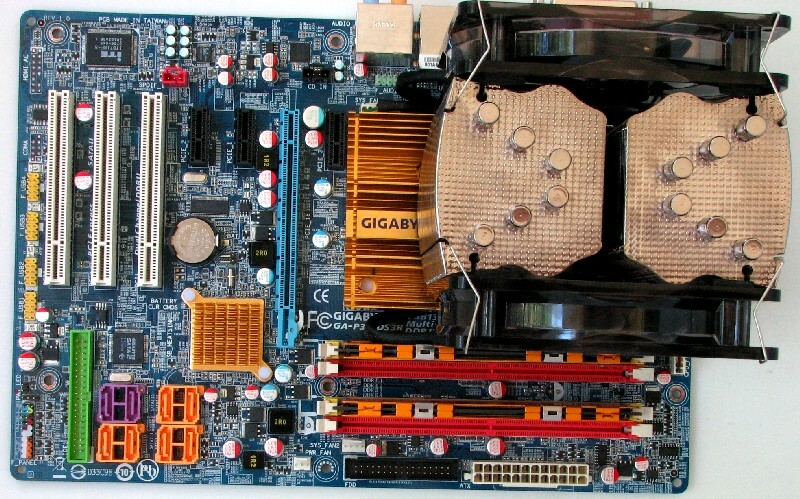 They do provide equipment tp mount this heatsink to older AMD socket 939/754 systems though, just like their last offering, which is good for folks still running that older platform. Looking at the cost of this heatsink as compared to its stable-mate in their stock configurations, it’s hard to justify the extra money for the minimal gain in cooling ability I saw during testing, in my opinion. You do get a PCI bracket dual fan controller and get a more efficient heatsink design, but the included fans are weaker than the ones that come with its brother. With that said, some people might want the choice of either PWM or voltage fan control and wouldn’t mind the extra money this cooler would cost. 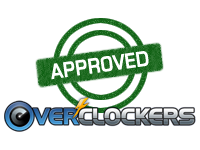 Since it did perform decently and the cost isn’t prohibitive, this heatsink earns an Overclockers Approved rating. 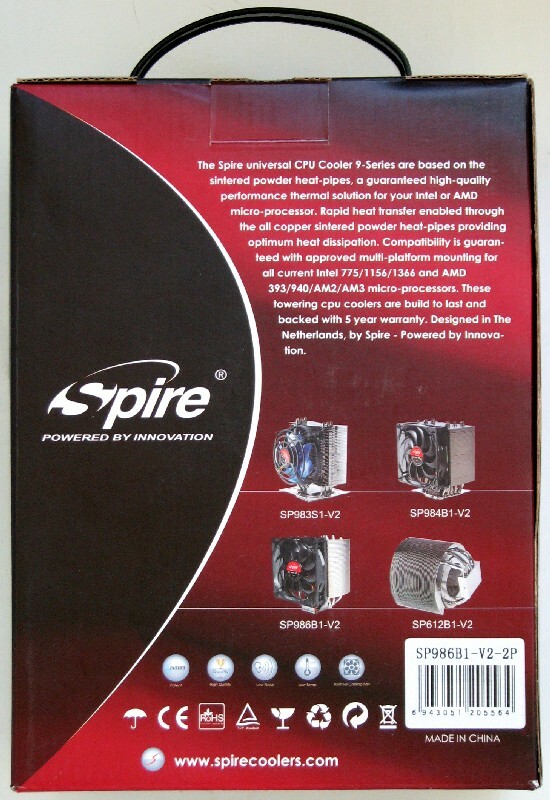 In closing, I would like to thank Spire for giving me the opportunity to review another one of their premium heatsink choices. This heatsink performs decently, but with just a little more work I think it could cool up with the best of the competition. 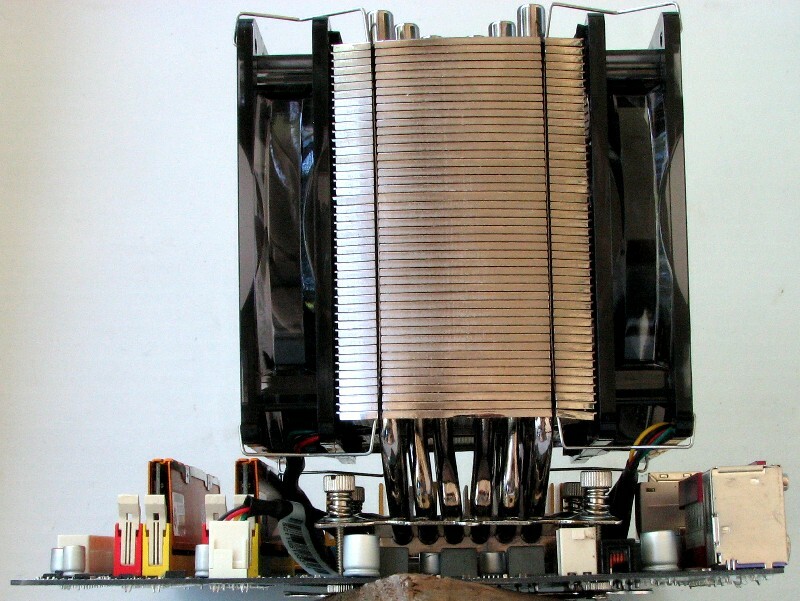 As it stands now, it isn’t quite there and lags the best of the Tier 1 heatsinks a bit. Stay tuned friends and neighbors, because I have some really interesting heatsinks coming up soon for review. 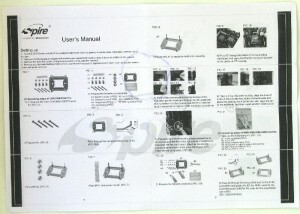 Thanks for another good, objective heatsink review. Thanks guys. I try to be as objective as I can with any heatsink or other product I review, no matter if it's something I buy or something that has been sent for review. 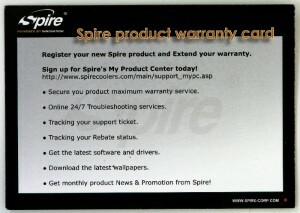 In Spire's case, they have been asking my opinion on how to improve their products since this review was published, which tells me they are serious about improving their product (since I did find some areas I think need improvement). Very well written and objective article. It was especially helpful for me (new to overclocking and building computers) to understand some of the facets of a heatsink. Thank you.